How to peel hard boiled eggs easily? This is one of the most annoying duties in the kitchen, for me. What are yours tips and tricks to peel hard boiled eggs easily? The worst-case scenario of egg-shelling is a farm-fresh egg. That annoying film that sticks to both the shell and to the egg will detach, the older the egg gets. The bubble at the fat end, too, will get bigger as the egg ages, which also makes the bottom cap pop off more easily. Obviously, we don't want rotten eggs. We want the almost expired but not expired ones. Roll the egg against the countertop, cracking it along the "equator". This will give you lots of starting points, and it will weaken the shell in enough directions that the rest of the peeling becomes easier. Usually, the top and bottom caps come off in large and clean pieces, so don't bother cracking that part unless it sticks. Start from the fat end of the egg. After much experimenting, I've determined that starting from the bottom of the egg (the fat end) is the best way to do it. Give the egg one good whack on the countertop, and the bottom caves in quite easily. This gives you a really nice starting point. Now peel out from there in a spiraling pattern down the rest of the egg. The top cap still comes off quite easily in one big chunk, if the egg is old enough. Peel them under running water. This helps to separate the egg and the skin under the shell. After boiling the eggs—and note that boiling them longer helps to make them easier to peel—let them sit for a while in a pan of cold water. I add ice cubes to the water and put the pan in the refrigerator. Once cold, crack the "bubble" at the flat end of the egg by knocking it against the counter or the edge of the sink. Tap a few more times around the rest of the egg to get a few cracks in the shell. Next, gently roll the egg between your palms, applying just enough pressure that you can hear the shell cracking. You want to be distorting the shape of the egg enough that the now-solid part in the middle flexes away from the skin and shell. Finally, starting at the cracked "bubble," work on separating the skin beneath the shell. The idea is not to peel the shell, per se, but to peel the skin, which will also slough the shell. The only challenge arises when the skin won't separate from the solid inner part. Once you're down to picking bits of the shell off, you've lost. It's then very difficult to maintain the integrity of the egg's surface. I haven't found running water over the egg to be helpful. It makes the shell sticky. Better is to cook the eggs a little longer and soak them afterward, so that there's still some moisture sitting beneath the skin. If the skin remains moist (and, hence, thicker), it will separate more easily from the solid inner part of the egg. Always boil a few more eggs than you'll need, and, if the intention was to present the eggs as, say, deviled eggs, use the rejects for egg salad. Apart from Sam's answer, the only important aspect of peeling a hard boiled egg is moisture. When the skin under the shell is dry, it sticks to the egg-white. The best result (100% success) is to crack the shell and place the egg in cold water (I've never tried warm water, but wouldn't be surprised if that works fine as well). After a short while (one minute), start peeling. Whenever the skin is still dry, just dip it in the water. I recently watched a friend use a spoon to peel the shell off very easily. She turned the spoon so that it cupped the egg and gently used it like a chisel, neatly scraping off the shell. The shape of the spoon is important, so try various sizes and shapes if necessary. Also it helps to peel the shell when the eggs are still warm after boiling. You can use an "eggies" - egg-shaped plastic vessels you crack the egg into, close up, and boil. I found these in our area 99¢ stores. They consisted of 4 major pieces. After OILING each part of each eggie (this is absolutely critical), assemble the eggie completely except for the top section (like a lid with a handle). This opening is just the right size within which you pour your cracked open egg. This can happen with the smallest amount of wasted white. Seal this translucent little contraption well (pressure DOES build up in them), but do not over-tighten the little lid. Boil as usual, making sure they float a little. Take them out and let them cool (so you can handle them). When you open them, voila, the boiled egg just falls out. With a spoon using only the weight of the spoon slightly crack the fat end. Put warm water in the pot stack with fat end up (it lets out air). We always added salt but not sure that helped. Slowly bring to simmer. Cook for like 10 minutes. Don't drain run cold water in to cool. Then add ice. Roll gently on a hard surface to crack the shell and then the shell just slides off. Or can roll / squeeze in your hand. Store in water in a seal container. Boil them according to your custom, then let them sit in that hot water for a few hours. If you happen to forget about them all the better. Then when you remember, or lunch time has arrived, drain and peel. They should peel lickity-split. I eat a couple of eggs a day and boil a week's worth all at once. After I reclaim and refrigerate them, they peel quite easily. Figured out that beastly problem all by my lonesome, Grandma! Old question, but I fought a lot with this recently. Here's the technique which I found works best. It's an old technique, but seems to work well even with fresh eggs. Put them in the fridge. Peel under running water for best results. It's fairly tolerant of variations such as letting them boil for a minute or two, or leaving them for a bit more than 15 minutes. So that makes it very easy to do while you are pottering around with other things in the kitchen. Add cold eggs to already-boiling water that has salt added. Let boil requisite amount of time. Once you're done boiling the eggs, immediately place them in a cold water/ice water bath. Let them cool down before peeling. Once they're cool, peel the eggs. Or store in the fridge to be peeled later. I've tried adding eggs to cold water and then bringing the water to the boil. No amount of cool water or cooling the eggs at the end makes them easy to peel. Steaming eggs - not much luck there, either. Pressure cooking eggs - that comes a close second. Not the answer you're looking for? Browse other questions tagged eggs peeling or ask your own question. How can I obtain perfectly peeled boiled eggs? What are some of the best ways to shell an egg? Do salt or vinegar in the boiling water help peeling eggs? What am I doing wrong soft boiling my eggs? Why and how does the egg white stick to its shell when cooked sous vide? Does it matter if I start boiling hard eggs in hot or cold water? Are refrigerated hard boild eggs really unsafe after a week? Shelf life of soft or medium boiled eggs? 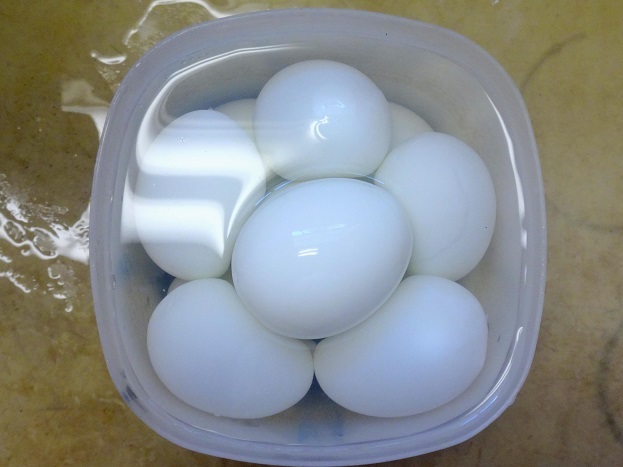 How to store hard boiled eggs that are peeled so to avoid moisture build up? How to cleanly slice hard-boiled eggs? Citric acid for hard-boiled eggs? Egg freshness--stale eggs at market?